Truly excellent products, the very best of the best, have a timelessness that defies all the rules of modern production. Stressing quality over quantity is considered an antiquated and naïve proposition in today’s world, and yet, somehow, true excellence endures, albeit in minuscule amounts aimed at the very discerning. Side-by-side shotguns, fine bolt-action rifles, the classic drop-point hunting knife—other tools may get the job done, but nothing will ever transcend the classics. When I first moved to New York back in the early ’70s, the world’s greatest sporting goods store stood on the corner of Madison Avenue and 45th Street. Its name was Abercrombie & Fitch. Today Abercrombie & Fitch is most famous for making the kinds of clothes you won’t let your daughter wear and marketing them in the kinds of catalogues you don’t want your wife to catch you reading, but back in the day it was the place to go when your dreams of adventure were greater than your wallet would allow. In addition to Griffin & Howe rifles and Randall knives, A&F sold safari gear, arctic gear, Himalayan gear, and boots and hats and tents and every kind of hunting and fly fishing equipment—everything you might possibly need or want for outdoor adventure, much of it made by Willis & Geiger. Today, Willis & Geiger is no more, a fallen victim to corporate greed and the Walmart mentality, where cost trumps quality, but pre-owned items (including clothing, believe it or not) still occasionally appear for sale on eBay at extraordinary prices, and that should tell you all you need to know about the quality of Willis & Geiger—which will also tell you something about Burt Avedon, the man (along with his partner, Susan Colby) behind Willis & Geiger for the last 20 years of the company’s life and the man now behind Avedon & Colby. The launch of the Signature Field Shirt could not have happened without our successfully funded campaign on Kickstarter! "Bob Van Enkenvoort: Avedon and Colby keep pushing forward, challenging themselves"
“Why not?” That’s what you’ll hear when you ask Verona resident Burt Avedon why, at age 91, he’s involved in a Kickstarter campaign to raise money for the Avedon & Colby brand field shirt. Avedon and his longtime design partner, Susan Colby, 73, rural Verona, finished a Kickstarter campaign Friday that exceeded the $12,000 sought to market their shirt by more than $3,000. Avedon and Colby have worked together as a design team specializing in premium performance clothing for almost 30 years. 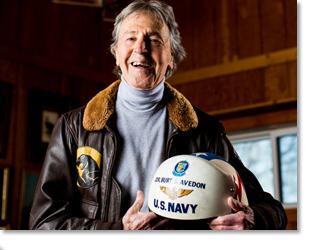 Avedon earned his pilot’s license at age 12. He was a U.S. Navy fighter pilot during World War II and the Korean War and later was a test pilot, Top Gun instructor and bush pilot in Africa. After a 30-year military career, he earned a Harvard MBA.